By LaGayle ~ July 3rd, 2013. Recently, we hosted a party for close family friends prior to their move to Maine, and the theme was all things Maineâ€¦lobster, corn on the cob, blueberries, whoopie pies, and so forth. The children even enjoyed a fun game of pin the tail on the lobster. The â€œMaineâ€ dish was lobster casserole bites. After having the lobster casserole bites at the party, we decided it would be a great dish for a challenging wine pairing. As we are approaching summer when people frequently enjoy white wines, we decided that the timing was right for this challenge. 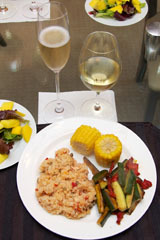 Our menu consisted of mixed greens topped with fresh mango and pineapple drizzled with mango balsamic vinegar, the lobster casserole, corn on the cob, and sautÃ©ed zucchini with roasted red bell pepper and sun dried tomatoes. Once again, we referred to the book, What to Drink with What You Eat, and decided to go with a Sparkling Wine and a Chardonnay. 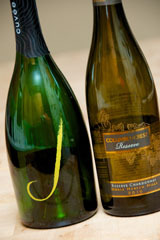 We selected the J Vineyards CuvÃ©e 20 Sparkling Wine from California and the 2010 Columbia Crest Reserve Chardonnay from Washington State. Both wines were very good; however, the consensus favorite both before dinner and paired with the lobster casserole was the Sparkling Wine. What would you have paired with this meal?Â And, as always, we welcome your suggestions for future challenging wine pairings. NV J Vineyards CuvÃ©e 20 Sparkling Wine (Russian River Valley, Sonoma County, California): Small, very fast bead of bubbles. Pale straw yellow. Nice nose with pear, apple, and lemon aromas. Granny Smith apple and lemon come through on the palate. Dry and light to medium-bodied with very crisp acidity. Well-balanced and refreshing with a long, lingering finish. 2010 Columbia Crest Reserve Chardonnay (Horse Heaven Hills, Washington): Pale, greenish straw yellow. Nose is a bit tight at first and then butter, oak, and floral notes come through. Apple and butter dominate the palate. Dry and medium-bodied with lively acidity and a long finish. “Bubbles” is/are always the default choice!